October is a month full of color in Michigan, and the birthstone is Opal, which seems fitting with its kaleidoscopic of colors and glints of rainbow flecks. As you may know, I like to explore the what is “not so known” about each birthstone. Since Pink Tourmaline is also an October birthstone, I have found Black Tourmaline to be much more intriguing. 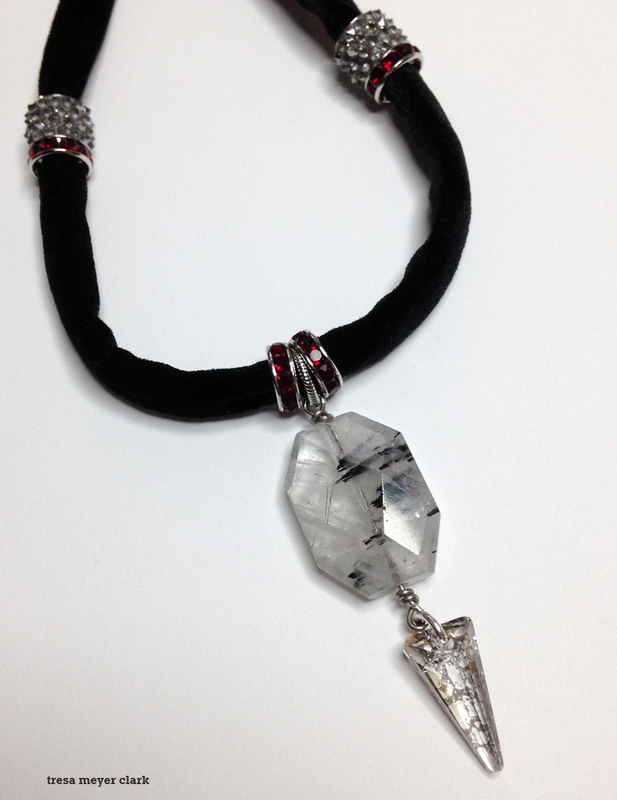 In a village in Saxony, Germany called Zschorlau or “Schorl”, ancient magicians used Black Tourmaline, known as Schorl, to protect them from evil in their spiritual rituals. Nearby there was a tin mine where black tourmaline was found. I find it amazing that in other parts of the world, Native Americans and African shamans included black tourmaline in rituals as protection against negative spells or curses as well. I hope you learned something new about the October birthstones. Thanks for reading, you are awesome! Please share with your friends on Facebook and Twitter! beyond my own belief of boundaries. The gold tones and shadows in this shot can only be captured at a sunrise or sunset. 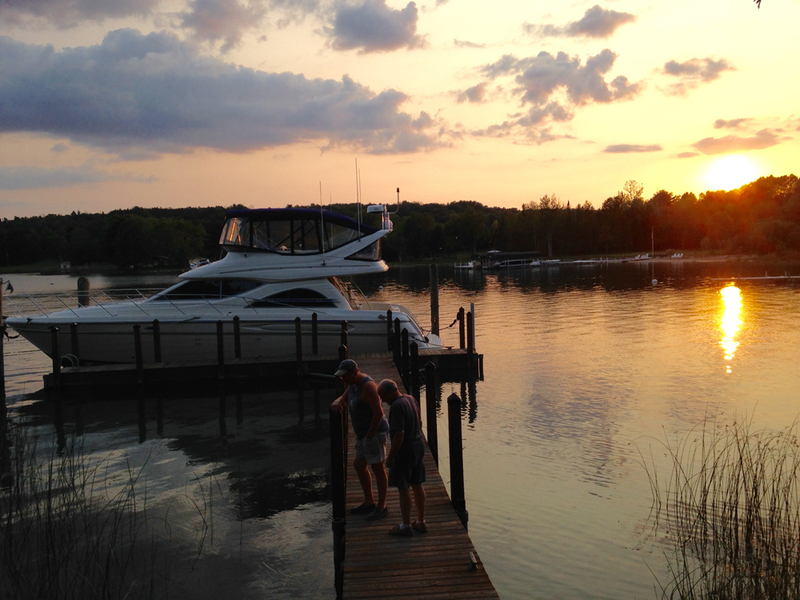 This is one of my favorite times while on vacation in at Clinch Marina this Summer. We were there for five days because the wave height on Lake Michigan was at eight feet! Thank you for stopping by, and please don’t forget to share with your friends on Facebook! OK, see you soon. 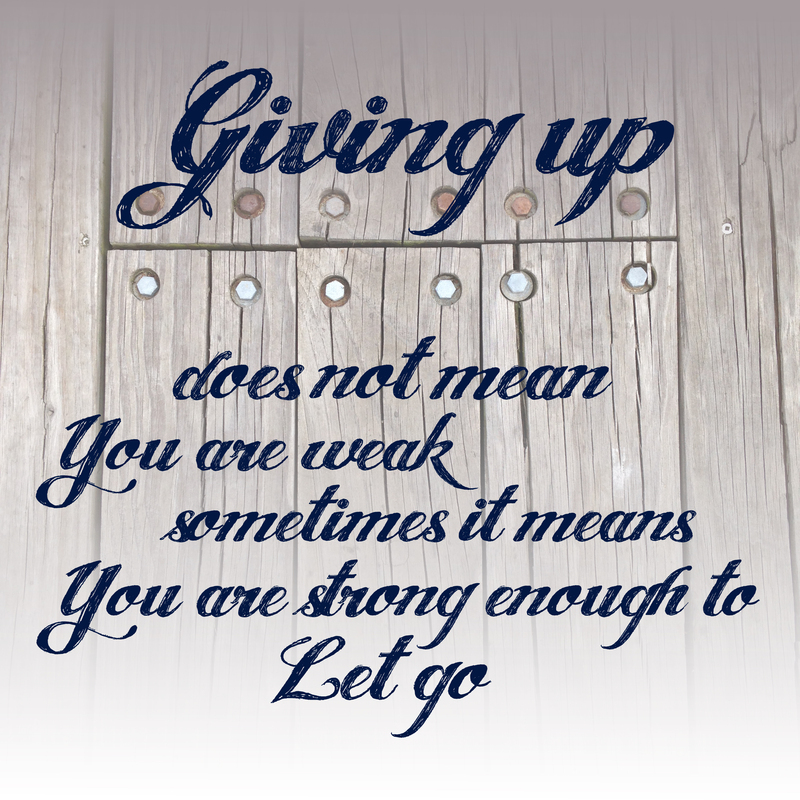 If you like this post, please share with your friends on facebook! As a graphic designer, my eye is trained to automatically find contrast and balance in my compositions. 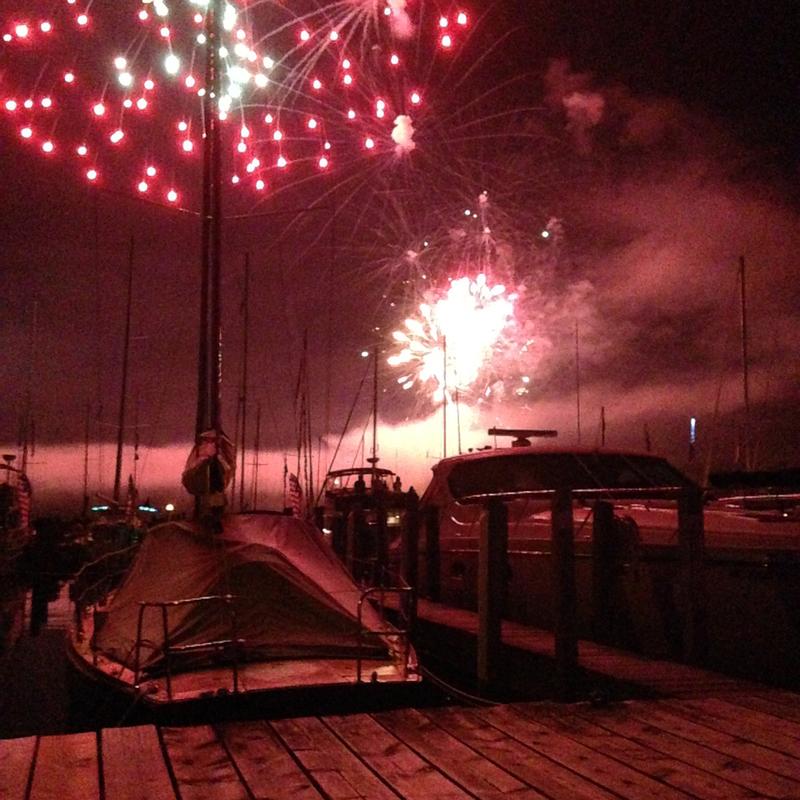 This image of a fireworks display from the fourth of July this year, has a rich gradation of pink to burgundy. Even though this shot is monochromatic, it is still full of color and energy. Capturing this color on my iPhone was surprising to me. What surprising photos have you uncovered this Summer? The tiny single flower caught my eye along side of the dock. I’m glad I took the time to photograph this. Looking forward to seeing how it’s changing, or if there are more, later in September. 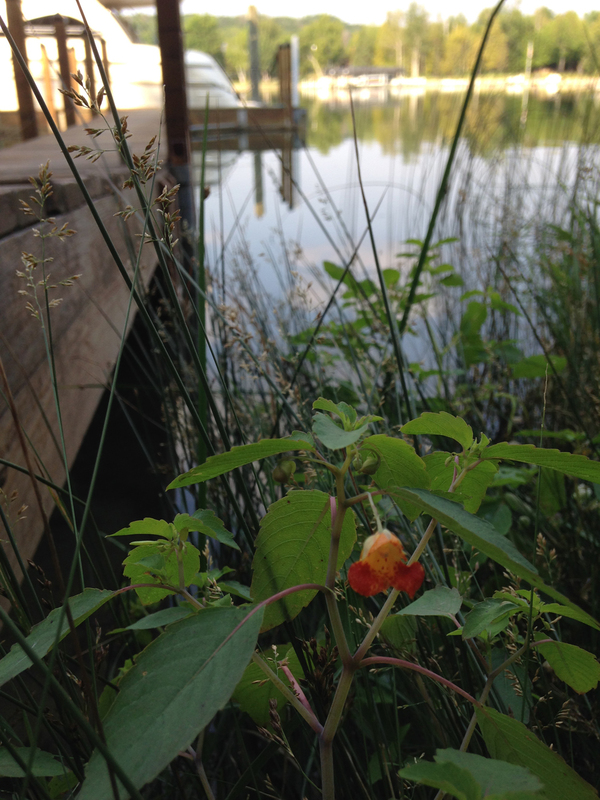 A tiny slipper shaped flower growing in water next to the dock. 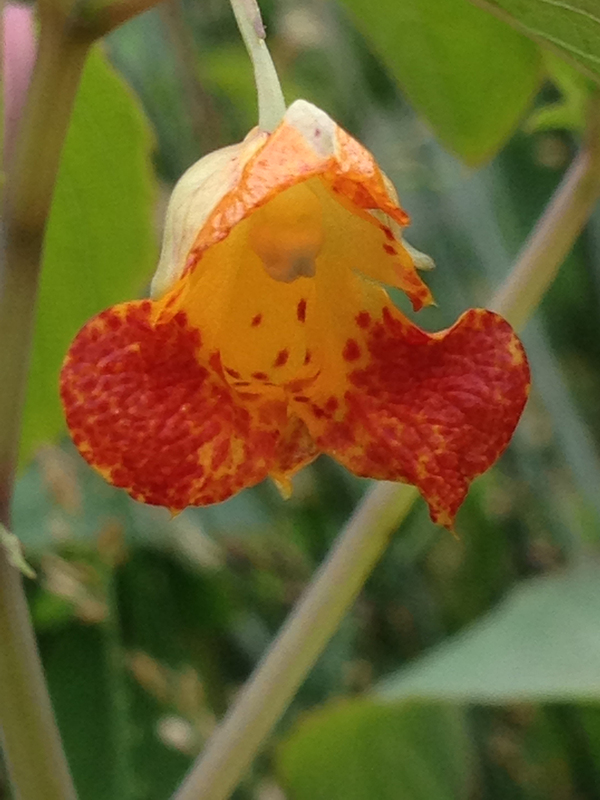 A look inside the pretty speckled yellow and orange flower. After further research, I decided to reference, Artfire.com. 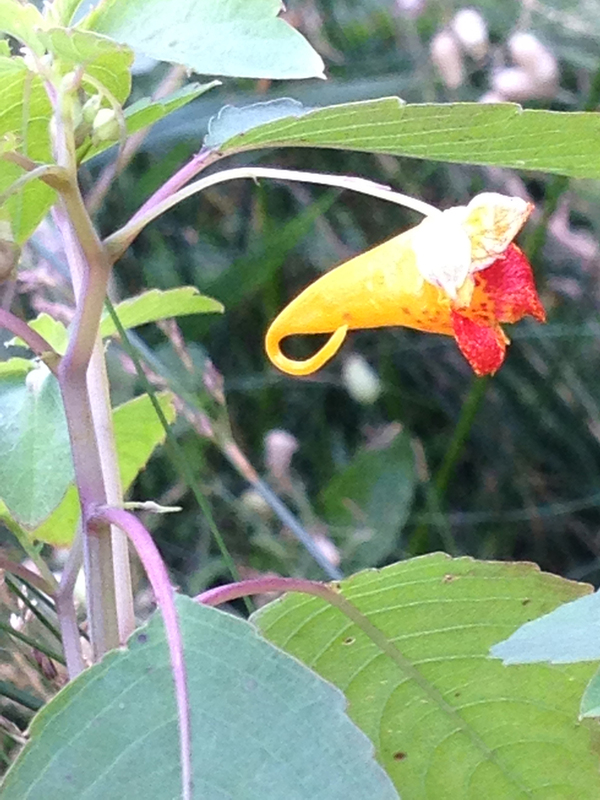 where I found the definition of the flower, and its medicinal uses by Bonnie Klisiewicz Bartley. iPhone Photography by Tresa Meyer Clark. To Learn More about Bonnie Klisiewicz Bartley, the “Soapsmith”, visit her facebook page. Is there one word to describe feeling happy and sad at the same time? 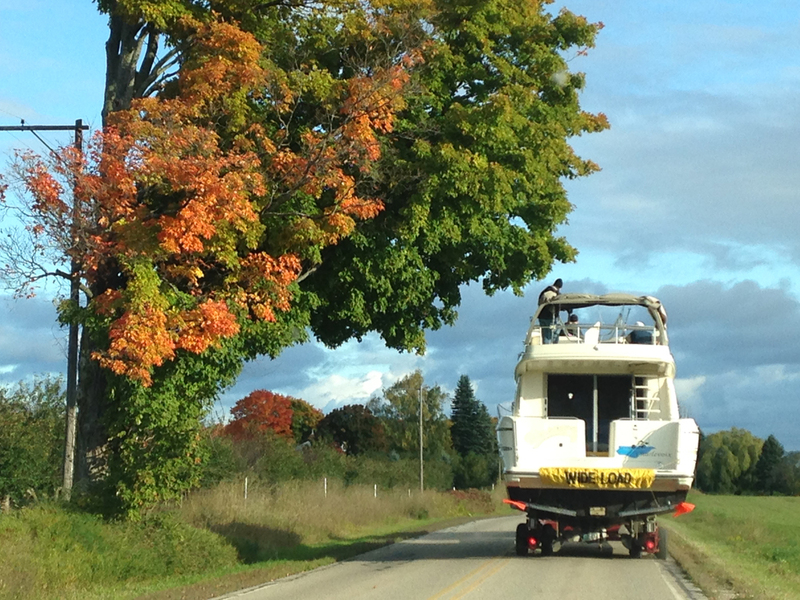 The last day of August brings to mind how very short the Summer season is in Michigan. While I’m feeling melancholy that my favorite season is almost gone, I pore over all the Summer months of photos to get a sense of time gone by. Summer Sunset with Dad and Ron. Capturing the tiny details of flowers at different angles, watercolor sunrises and boats were my subjects this year. On August 22, my Dad and my Husband on the dock studying something in the water at sundown, symbolizes the goodbye to Summer for me. Still, I’m happy because we were all together in this beautiful place. 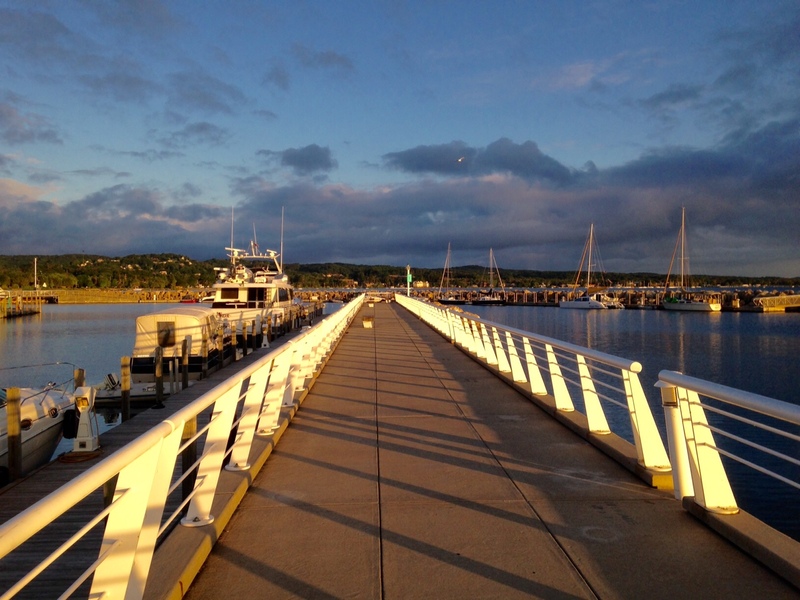 We are always happy to visit Traverse City, Michigan. 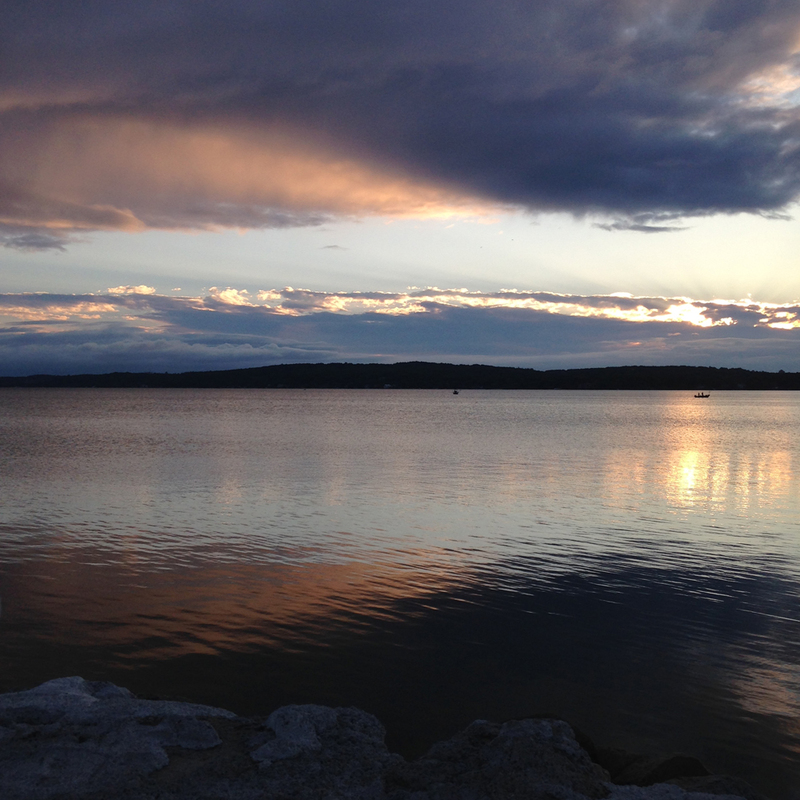 Traveling by boat is the only way in my opinion, because the water and the scenery in Grand Traverse Bay is gorgeous. 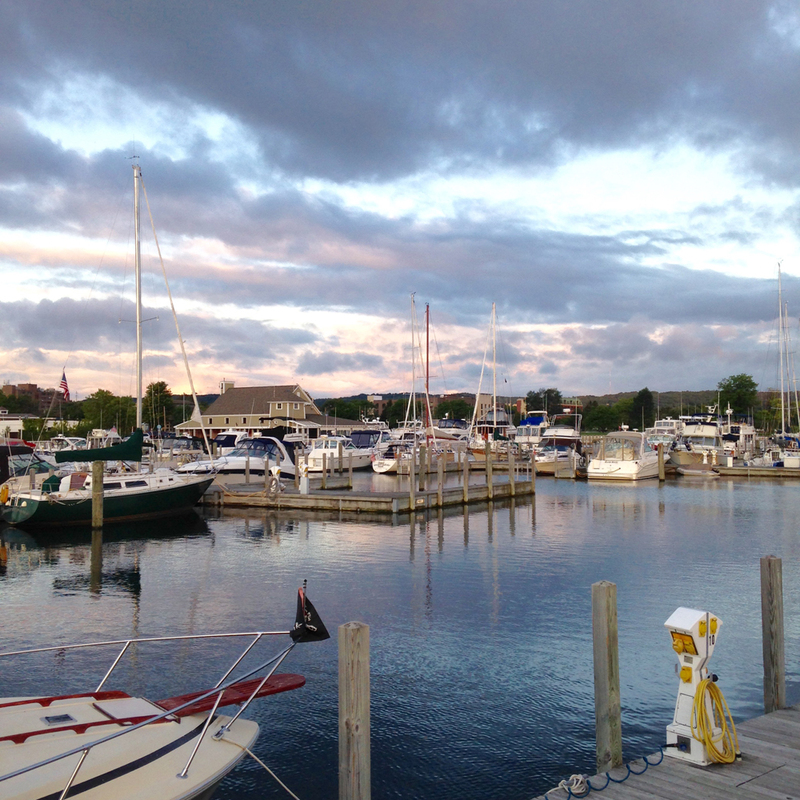 It takes us almost three hours to travel from Lake Charlevoix to Clinch Marina where we were docked. In this mini “mesh” photo gallery is a pic of a sail boat, and my husband on our power boat. Also, at Clinch Park, I quickly grabbed my camera to capture the cutie patootie toddler, who at first, seemed to be walking all alone. I love taking pictures, and there are lots of opportunities to capture beautiful sunrises and sunsets too. Look forward to posting more soon.